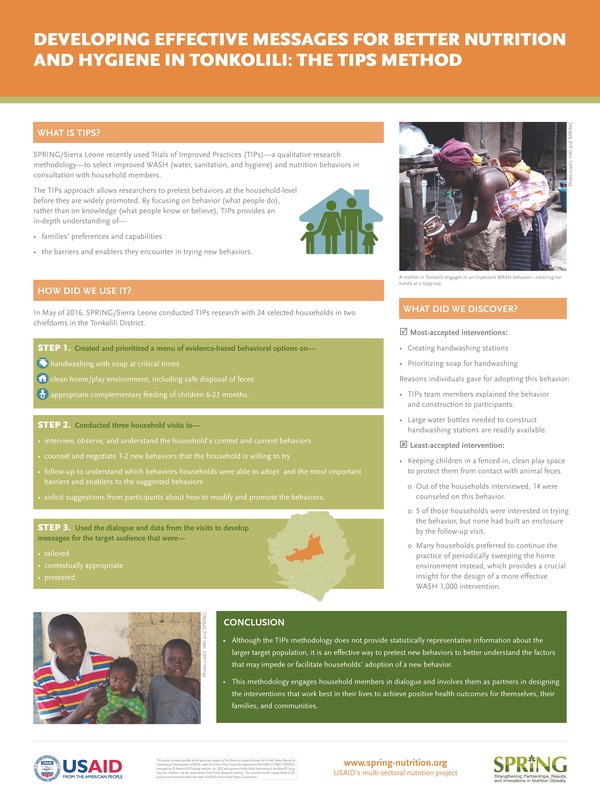 SPRING/Sierra Leone recently used Trials of Improved Practices (TIPs)—a qualitative research methodology—to select improved WASH (water, sanitation, and hygiene) and nutrition behaviors in consultation with household members. the barriers and enablers they encounter in trying new behaviors. In May of 2016, SPRING/Sierra Leone conducted TIPs research with 24 selected households in two chiefdoms in the Tonkolili District. appropriate complementary feeding of children 6-23 months. solicit suggestions from participants about how to modify and promote the behaviors. TIPs team members explained the behavior and construction to participants. Large water bottles needed to construct handwashing stations are readily available. Out of the households interviewed, 14 were counseled on this behavior. 5 of those households were interested in trying the behavior, but none had built an enclosure by the follow-up visit. Many households preferred to continue the practice of periodically sweeping the home environment instead, which provides a crucial insight for the design of a more effective WASH 1,000 intervention. Although the TIPs methodology does not provide statistically representative information about the larger target population, it is an effective way to pretest new behaviors to better understand the factors that may impede or facilitate households’ adoption of a new behavior. This methodology engages household members in dialogue and involves them as partners in designing the interventions that work best in their lives to achieve positive health outcomes for themselves, their families, and communities.